What happened to the siren icons I grew up with? No really, sometimes I think about the cartoons I grew up watching and they taught me that women could be strong, independent, crime fighting, creative role models just as good as, if not better than the men in cartoons. While I loved Transformers and even crushed on the turtles Jem was the girl for me. A woman that not only had a heart of gold to run an orphanage but an alter ego of a rock star. One of the most traumatising days of my childhood was when my cousin flushed my Jem doll down the toilet and her ear rings stopped flashing all because she was "not as pretty as Barbie". 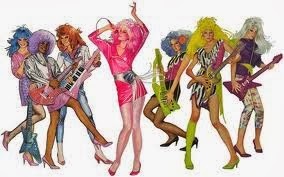 Jem's constant battle with 'the misfits' a naughty band of women who ironically I kinda loved too filled my weekend mornings. Although Jem wasn't killing mutants or saving the planet she taught girls it was cool to be a bit different and you could even have good values.You didn't have to be obnoxious and have a diva ego to be someone awesome. She was truly outrageous but full of morals every young woman needs. She-Ra Princess of Power almost speaks for itself for why she is in my childhood idols. Even though at first glance she looks like a dainty blonde with a huge sword one of She-Ra's powers was her incredible strength. She could take on men but only used force as a last resort. If girls grew up with She-ra I could get this unicorn obsession which seems to be sweeping the world of young women out there. Her faithful steed a rainbow winged unicorn. I love the fact that even though He man was her brother they made her just as strong and just as capable to take on the evil of the world. 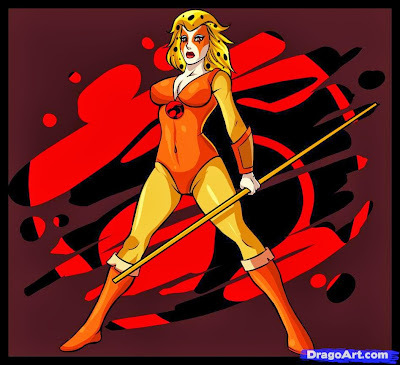 As sweet as she is courageous Cheetara the first female Thundercat. I remember having the toy as a child and making my mom paint my face like her while my brother told me I could only be April from the turtles or Cheetara when we were playing games and personally I think April didn't bring much to the table compared to Cheetara. I only wish her speed has inspired me to be into running. Her six sense to see into the past and future is something she felt was a curse but then don't we all dwell on things we shouldn't. Another strong well rounded female icon that blazed across my screen and into my heart. This one may seem like a surprise but there is more to Rainbow Brite than meets the eye. All the other women in this post you can tell just by looking at them that they are strong and in control. This is great as a child to aspire to grow up into but what about the kid right now? 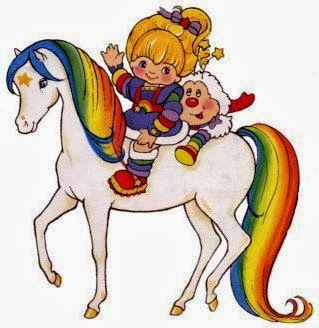 Rainbow Brite taught me that I could still be determined and outspoken even as a small girl in the big bad world. Her duty was essentially to bring colour to the world save her friends and keep the shadows from taking away the colour. What I liked is even though she had a cheery sunshiny attitude you still saw her get sad and angry displaying these emotions in cartoons is important to help children understand that it is OK to not always be happy but we should always try and look after each other and really find the best in what we have. Cartoons for me growing up were full of morals and excitement. Teaching both boys and girls that women can be powerful important role models. What cartoons did you watch growing up?